Beth Bernobich’s first novel, Passion Play, earned her a coveted Romantic Times Book Award for Best Epic Fantasy in 2010 and Publishers Weekly called the second book, Queen’s Hunt, “A masterful story of romance, honor, suspense, with plenty of history, geography, and mythology thrown in for good measure.” Now she returns to tell the story of Éire, one of the most powerful empires in the world, in THE TIME ROADS (A Tor Trade Paperback Original; $15.99; October 14, 2014). The Anglian Dependencies are a dusty backwater filled with resentful colonial subjects, Europe is a disjointed mess, and many look to Éire for stability and peace. 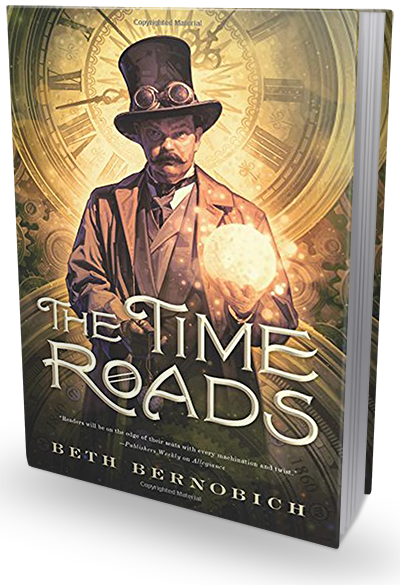 In a series of braided stories, Beth Bernobich has created a tale about the brilliant Éireann scientists who have already bent the laws of nature for Man’s benefit. And who now are striving to conquer the nature of time.